Recently I was in the Los Angeles area, helping my daughter for a couple of weeks. As she was having issues with her washer, on several different occasions I took her family's clothes to the laundromat. Usually this provided me a short "Grandma break," a chance to re-energize before returning to the cheerful chatter of little children. 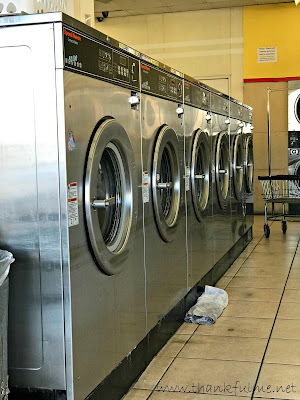 The final time I went to the laundromat, I did not have a zen-like experience. I did, however, have an experience that made me realize that I had valuable information that needed to be shared. Though I don't consider myself an expert in the fine art of flirting, I do know what doesn't work on me. 1. Don't confuse politeness with interest. I accidentally dropped something; you picked it up; I said, "Thank you," and you interpreted that to mean, "Let's chat for the remainder of the time we are doing laundry!" I promise that the child's plastic toy that inadvertently got washed and fell to the ground as I pulled clothes out of the washer was not a coy plot. 2. Don't make up common interests. When you asked me where I got my shirt, and I replied that I got it from a race I ran, don't tell me you are a runner, too. Runners, even slow plodding jogger types like myself, generally know the distance of their event. Telling me that you ran a long-distance race, but don't know how far it was ("but it was far!") doesn't exactly make us running buddies--even if you did say you would have to look up the half-marathon I am currently training for. (Did you even notice I was purposely very vague about the venue and the date of the event? Inept flirting is one thing, but please don't travel across state lines to stalk me at a race!) Asking me if race participants have to sign up ahead of time to compete also tipped me off that maybe you aren't really an experienced runner. 4. Don't use false flattery. When you were done washing and drying your clothes, and were exiting the laundromat, you informed me that I was "still an elegant lady." First of all, "Still?" You've known me an all-too-long hour or so. Now, I'm not being self-deprecating. My self-esteem is healthy, but "elegant" does not describe me, not even when I haven't just spent the past hour in a hot laundromat in southeast Los Angeles in July. Flattery will get you nowhere. 5. Don't flirt with a married woman. It won't work in your favor, and her husband will be the first to hear of your attempt. Photo: A screenshot of a text I sent to my husband. The selfie photo shows a very un-elegant me, with unruly hair pulled back in a ponytail. 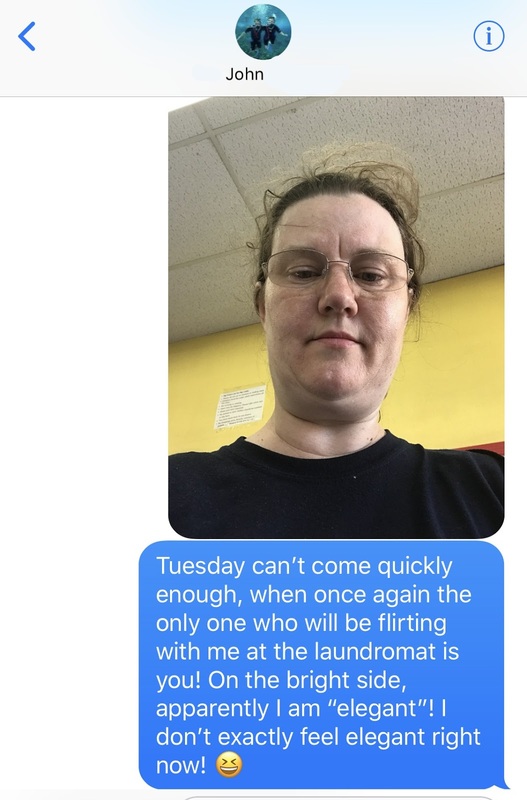 I texted,"Tuesday can't come quickly enough, when once again the only one who will be flirting with me at the laundromat is you! On the bright side, apparently I am "elegant"! I don't exactly feel elegant right now!" So, there you have it: five simple tips for flirting. Readers, do you have any more to add? Lol. You don’t look elegant in that pic! However, you are still one of my favorite friends! And you are one of my favorite friends, too! If you can manage to mention your husband, "My husband and I run most races together. He's such a sweetie for matching my pace." or something relevant to your own situation, this will often cool their jets. If not, do the best you can do leave as quickly as possible. Good tips for those on the receiving end. Oh my! LOL and I've never met you but think you're elegant. Promise that's not a pick-up line ;) He asked about your skin tone?? Huh. Funny post. I'm 67 and I still get flirted with (occasionally). You're much more patient than I. But...like I always say, "You have to admit, they have good taste."